The Morrison Institute for Public Policy at Arizona State University hosted the 2016 State of Our State conference event at the Phoenix Airport Marriott Nov. 16. The event addressed how Arizona voters are turning away from the two main parties. The institute is working on new research that addresses independent voting. The Volcker Alliance partnered with 13 academic institutions, including the School of Public Affairs, to study the budgets of all 50 states.The study will focus on laying the foundation for governors and legislators concerned about fiscal stewardship, while attempting to affect meaningful improvements in the quality and transparency of state budgets. Our David Swindell is working on this project. SPA is well represented by large contingent of faculty and students at the APPAM Conference. Read more about the highlights. New fellows elected to National Academy of Public Administration (NAPA) include SPA Director Karen Mossberger and Alliance for Innovation Board member Darin Atteberry. SPA's Mary Feeney has new research on what predicts transparency, accessibility and participation in local government, published in the Public Administration Review. Brooke Wheeler, a SPA alumna, earned a national award from NASPAA for her work with Maricopa County. Wheeler now works at the Bureau of Land Management. SPA’s David Swindell talks with ASU Now about what happens when a big storm, becoming more common, hits a major city. Geoffrey Gonsher’s PAF 200 class was visited by three judges earlier this semester. SPA’s Elizabeth Corley worked hard for a year to be approved as a Board Member for the Environmental Protection Agency’s Scientific Counselors. CORD hosted an October event with William Resh, a professor from University of Southern California. Arizona craft breweries are using special batches of reused water to create brews that then compete in the best toilet-to-tap brew competition. The Morrison Institute is co-sponsoring the competition. SPA’s Yushim Kim and Spiro Maroulis’ workshop focused on designing policy packages for healthcare reform. Students competed and innovated firsthand. A paper from Chris Herbst focused on the impact of parental welfare work requirements on disadvantaged children. It was published in the Journal of Policy Analysis and Management. Another paper from Chris Herbst focused on explaining the rise of the Internet in correlation to the decrease in the teen birth rate. In this Vox article, the question is about the Clinton Foundation actually saving lives. It mentions Ethan Kapstein’s work on the history of the global AIDS activist movement. Learn more about Ethan Kapstein’s AIDS research. SPA’s David Swindell completes a Q&A about the future of our skies now that drones are flying. 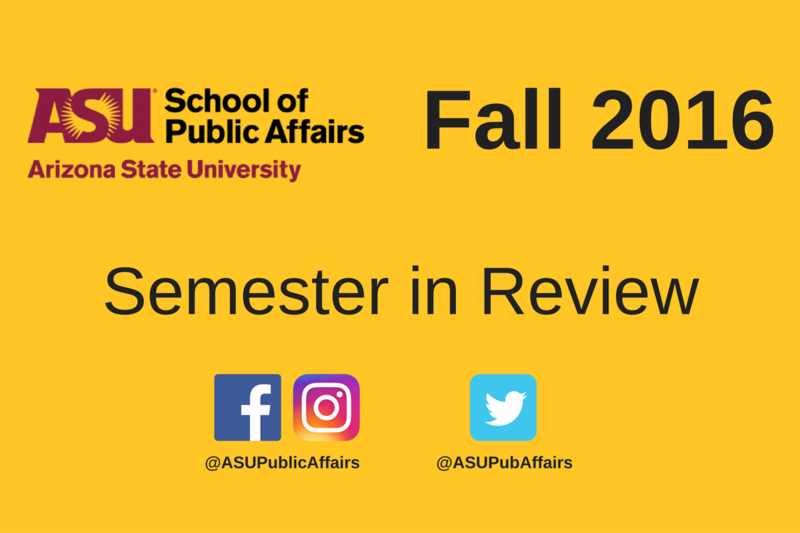 SPA’s Derrick Anderson moderated an October Public Administration Reviewpanel on the future of higher education, featuring ASU President Michael Crow. In this Governing article, Kevin Desouza shares that many professions have simulators to help train and prepare them for the jobs ahead. But not when it comes to public managers, who are often faced with highly complex or volatile situations. SPA students visited the Phoenix PD’s Communications Center in September. Some of the ICMA members are also Marvin Andrews Fellows. This research from Lily Hsueh took a look at the world’s largest companies by revenue, examining internal factors that motivate some companies to participate in transnational climate governance. The first report from the Valley Benchmark Cities effort highlights public services. The report presents data from the 11 largest Phoenix metropolitan area. After nearly two decades in the private sector, the center’s director, Hector Zelaya, now is working to help those in public service see how to improve leadership capabilities. A Slovenian magazine featured SPA’s Kevin Desouza in a spread for public managers. SPA’s Nicole Darnall awarded with 2016 Best Journal Article by Academy of Management in August.